A pared-down aesthetic is mostly used by businesses nowadays when designing their marketing tools as it provides more visual organization. It also promotes memory retention because the material becomes easier to remember due to its simplicity. Through the usage of minimalism in different projects and corporate undertakings, the contents of materials are not sacrificed when implementing the theme that businesses would like to achieve. Sleek lines, structured patterns, and simple images are commonly used as design items to provide a statement of clarity and cleanliness. This is the reason why a lot of logos, business company brochures, and the like are designed in a minimalist manner. Another item that has embraced this trend is the pizza menu. Just like any other restaurant menus, there are already a lot of pizza menus that have been designed with a minimalist approach. Though there are still some pizza boutiques and houses that use flamboyant designs, it is evident that there has been a rampant rise of businesses that have decided to go in a different direction design-wise. 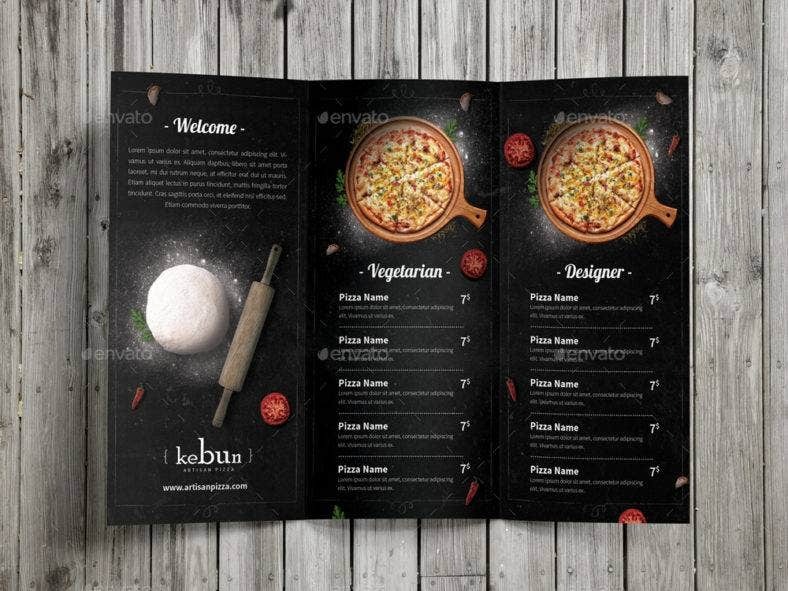 We have gathered ten pizza menu designs that are simple yet striking in their own ways. 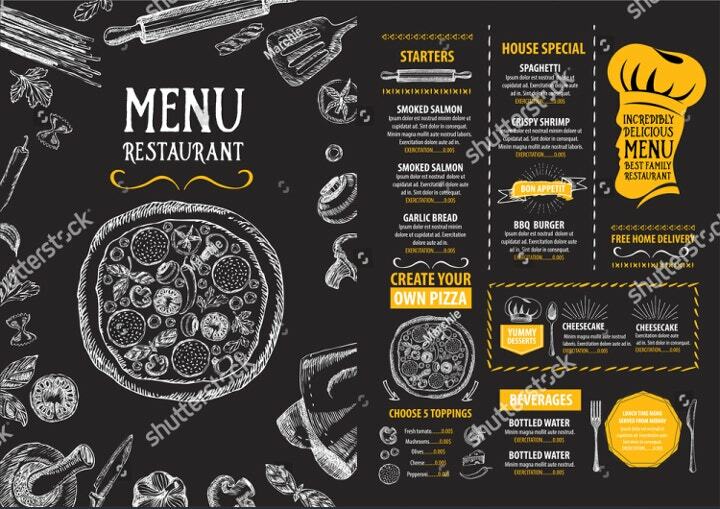 Browse through the selections below and get inspirations that can help you create your business’ own minimalist pizza menu design. Using minimal designs in creating a sample pizza menu does not mean that the output should be boring. You can select two to four colors that look good together so you can make both the design and content of your pizza menu pop out. As an example, you can use black as your background color and use white and orange as the color of your text, illustrations, and images. The contrast of the colors actually creates a combination that works. Do not be afraid to test different color combinations until you discover the one that works for you and your business. Color blocking and item placements are key factors in achieving this minimalist look. It will also be best if you will use big texts with a variety of designs as it breaks the monotony caused by your color blocking. 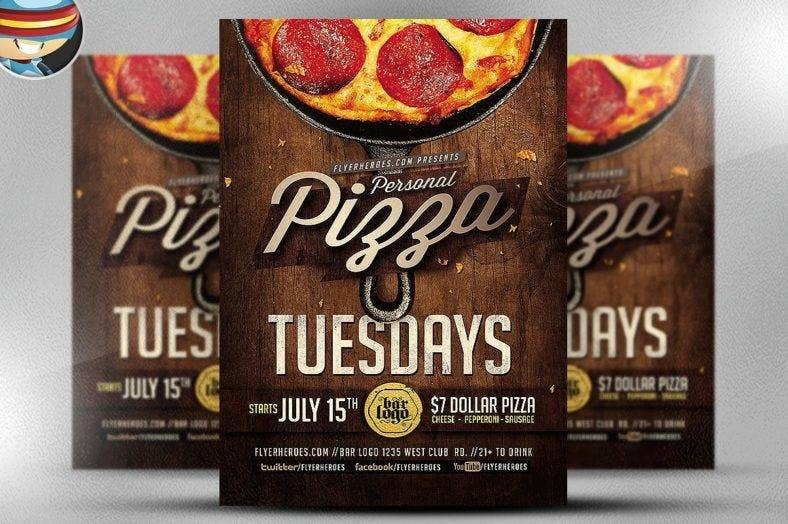 Make sure to consider your brand’s own aesthetic when using this type of pizza menu. If color blocking is not a part of your aesthetic, you can go the simple route and use the images of the pizzas that are available for purchase. 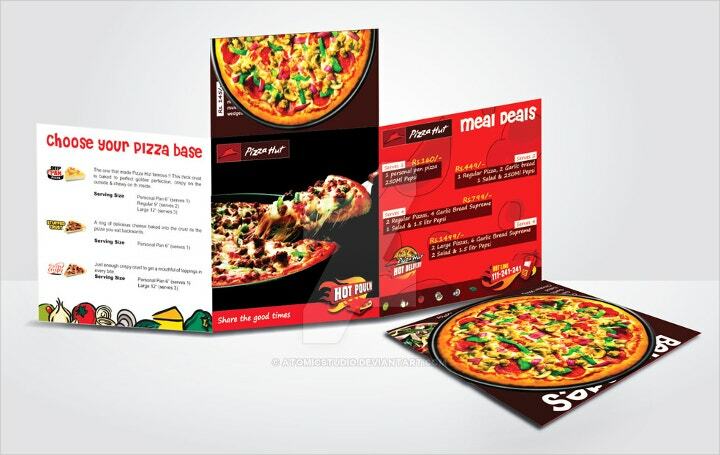 Your pizza menu can showcase all the pizzas that your business offers. This will emphasize the variety of flavors that you can offer to customers. This will also help in your branding activities as you can place the name of your business, which should be written with the biggest font, on top of the pizza menu. Below the actual images of the pizza flavors, you can list their names and the main ingredients that are used to create each of them. You can add a few raw ingredients used to create pizzas on the background like tomatoes, herbs, and flour to add character to the sample menu design. If you offer authentic Italian pizza, then using an Italian pizza menu is the way to go. 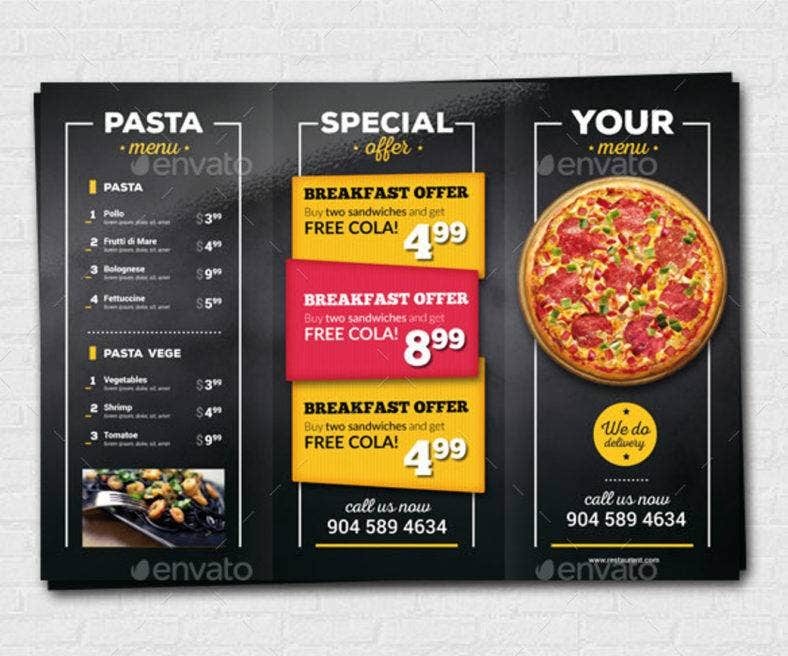 This can help you brand your pizza store even more as you can showcase the different Italian pizza flavors that your customers can order. Achieve this look by using the colors present in the flag of Italy. More so, you can incorporate a few Italian words in designer fonts that can make the design of the menu more cohesive and appealing. It can also help if you will add Italian spices and phrases to solidify the theme that you are going for. A minimalist pizza menu can also come in a bifold format. This will allow your customers to browse through your menu just as if they are looking at a book or a journal. A bifold vintage menu can give you the chance to divide your pizza offerings per page based on their differences. As an example, you can place bundles and other special offers on one side of the menu then you can put the actual prices of your regular menu on the other side. 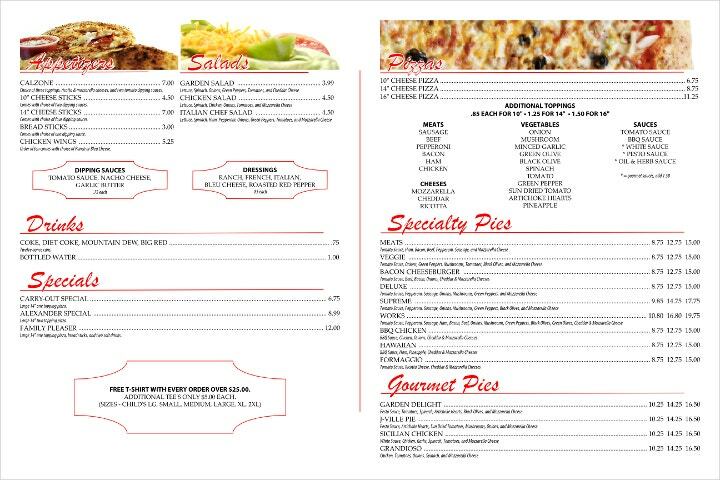 You can use block fonts or cursive design fonts when creating your bi-fold pizza menu. All you need to remember is that there should still be a design flow that can be seen in the menu even if it is split in half. Aside from bi-fold menus, you may also opt to use a trifold pizza menu. Trifold templates have already been used by restaurants when creating their menus for a long time. We highly suggest you use a trifold minimalist pizza menu if you have a lot of pizza choices in your store. Folding the pizza menu to three can provide you with appropriate spaces where you can place more information in an organized manner. 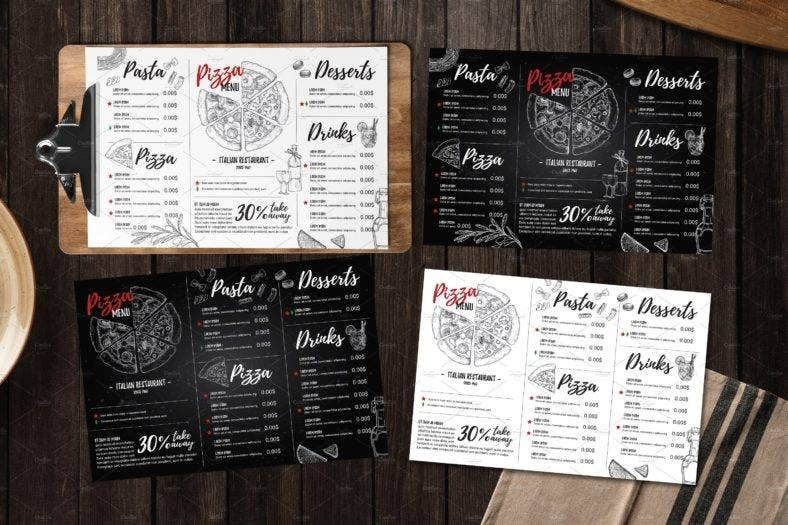 Clean trifold pizza menus can work best if you will use simple texts and images as too many of these design elements can make the overall design look crowded and disorganized. 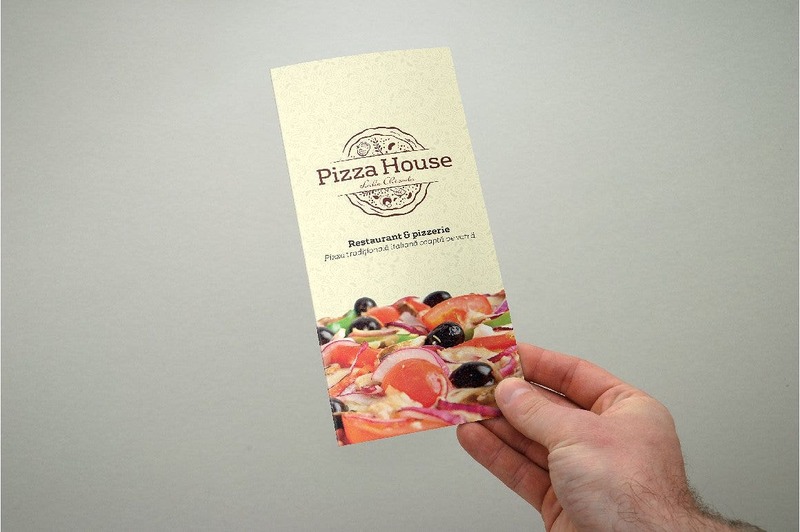 Minimalist pizza menu designs can also incorporate themes. As an example, rustic textures and effects can be placed on the menu so that the customers of the pizza business can associate the brand with longevity, heritage, trust, and loyalty. 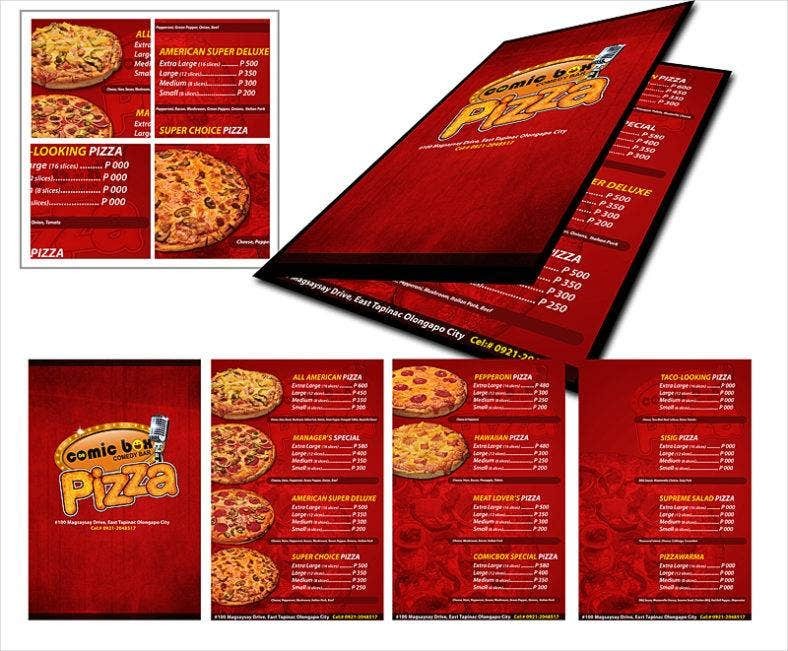 Pizza stores that are already household names in the pizza industry can make use of this kind of pizza menu design. A few pinches of flour in different areas of the menu works well as an additional design element. 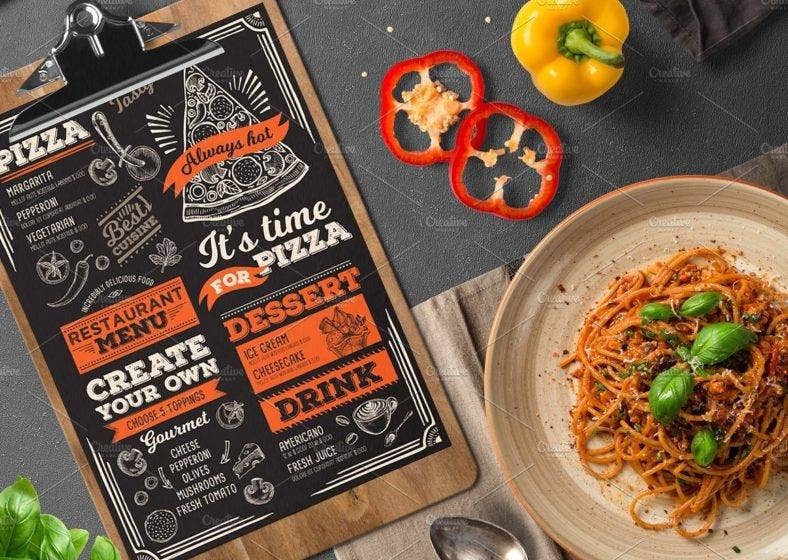 Using a rustic menu in presenting your pizza selection provides the ambiance of the home which can attract more customers to buy your products. Even if you are using a minimalist design, make sure that you can still make your pizza menu interesting. Having fonts that are bold and three-dimensional can get the attention of your customers even if your pizza menu does not have a lot of decorations. The way that you format your menu also matters as the information that you will place should be easily understandable as well as precise and accurate. Using vintage paper textures and other kinds of textures as a background can also be of help if you want to add something extra to your menu design. Once you are already familiar with this aesthetic, then you can easily create a pizza menu that will still stand out even if it is simply made. 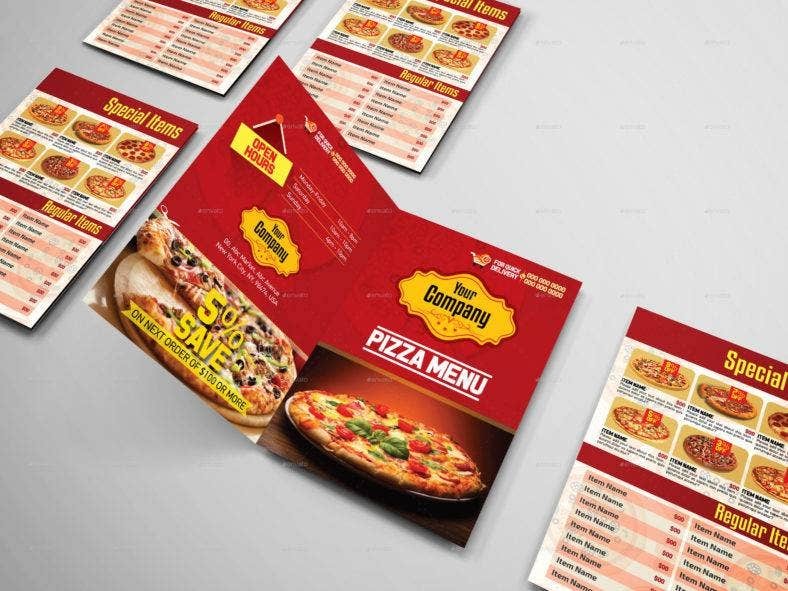 If you want a multi-purpose pizza menu, then using a menu flyer is your best option. 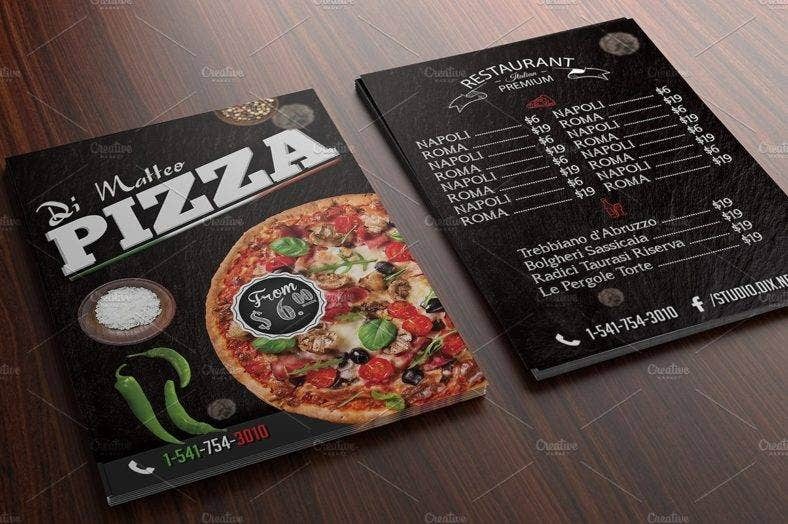 This type of pizza menu can be placed in the tables within your restaurant and can also act as your sample flyers during events. Creating an advertising and marketing material that you can use on a daily basis and during special events can help you maximize your resources. In terms of designing this kind of pizza menu, using the colors that we usually see in a pizza can help get the attention of customers. Incorporating the colors of cheese, pepperoni, and other pizza toppings can make prospective customers think of the actual pizza flavors that they can have a taste of in your restaurant. If we are to talk about simplicity as an aesthetic, using the colors black and white will always be included in the list. These colors are both elegant and classy which make them easy to use on different ways, especially when it comes to menu designing. Also, this will help the colors of your pizza images to be more enticing. A suggestion that you may consider is to provide menu pairings to your customers. 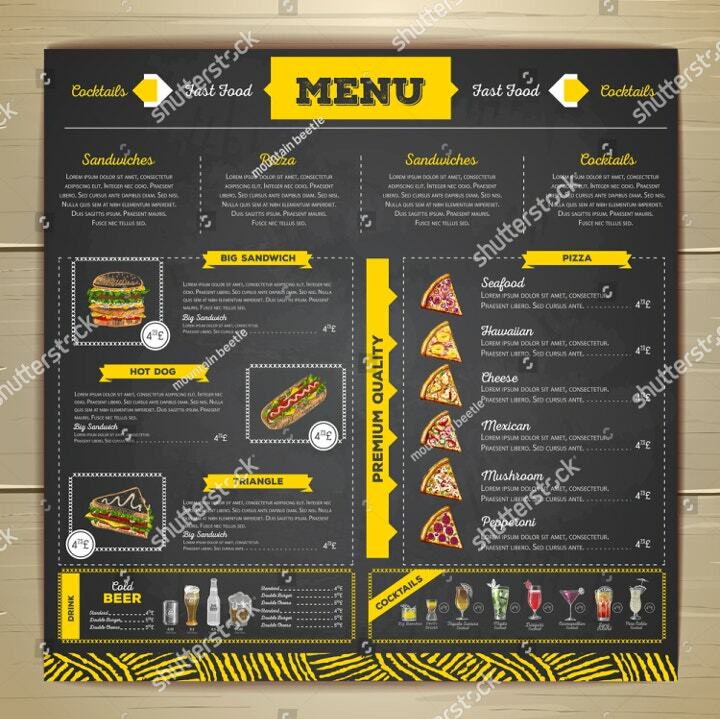 You pizza menu template can present a list of other kinds of meals that your customers can pair with your pizzas like pasta, fries, and burgers. The flavor combination of these foods can make customers practice their purchasing power even more in your business. 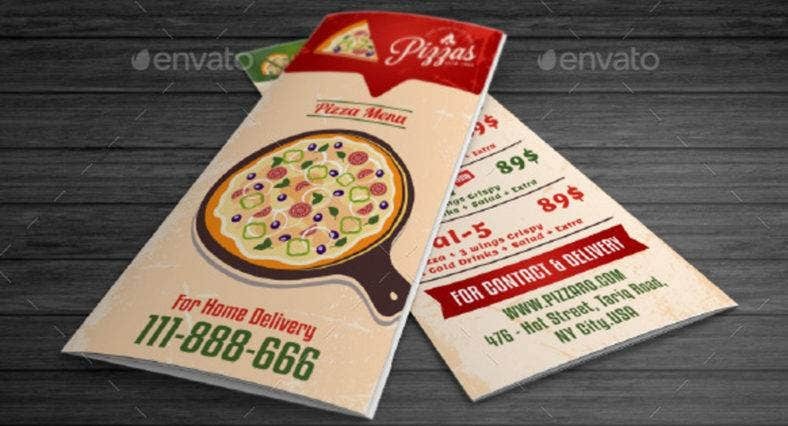 Aside from following menu description writing tips, using a simple design can make it easier for customers to identify the content of your pizza menu.When using a minimalist design, it will be best if you will use different font styles as it can separate the information that you would like to present from one another. More so, give focus to the names of your products, their corresponding prices, and the ingredients that you have put together in a specific pizza flavor. A minimalist pizza menu can only be deemed effective if it contains fewer details but it can still work accordingly based on the purpose of its creation. If you have a pizza business, using a minimalist design can be one of the last design options that you will think of. However, you have to remember that this particular type of design actually works if you are aware of its proper usage and implementation. 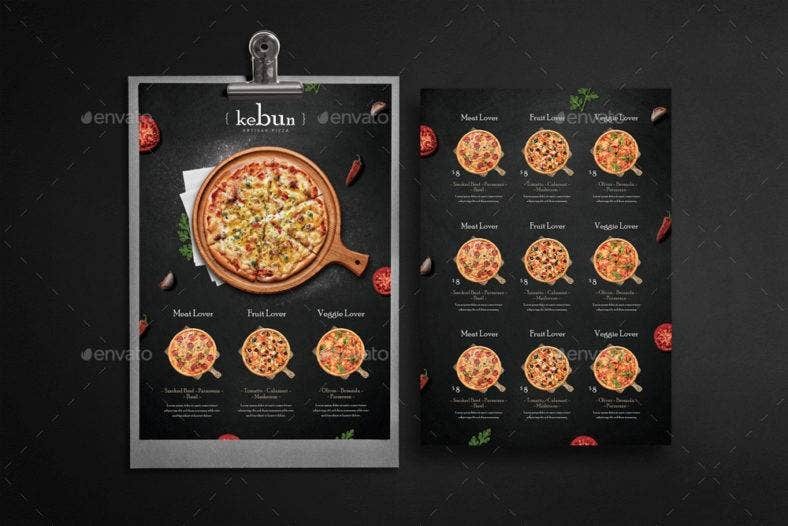 Do not hesitate to look at existing templates of minimalist pizza menus so you can have an idea of how you can create the same tool while maintaining the brand of your business.